Do you want to delve into the nature of reality by using science and ancient knowledge to understand your deepest self? If so, our Maharishi Vedic Science programs are for you. Maharishi Vedic Science brings together ancient knowledge, as brought to light by Maharishi Mahesh Yogi, with discoveries of modern science to understand fundamental questions about life. Does Maharishi Vedic Science prepare me for a career? Yes, Maharishi Vedic Science is a liberal arts degree program that focuses on personal growth and builds a strong basis for further career development. 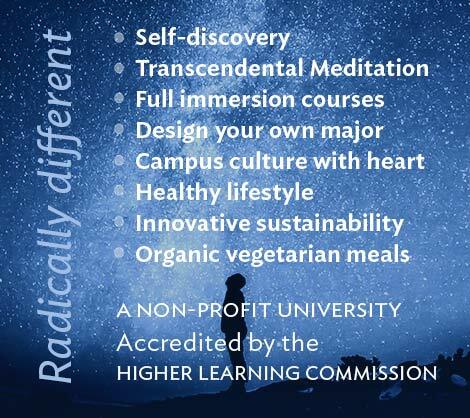 Our holistic degree programs — which consist of thought-provoking classes, a healthy routine, vegetarian food, daily meditation, and more — will help enhance your creativity along with other vital skills that employers value. In addition, you can take modules to become a certified Maharishi Yoga consultant. You can gain skills to teach others how to experience the state of Yoga during Transcendental Meditation practice and how to perform a sequence of Yoga postures (asanas) designed to support the experience of Yoga during meditation practice. Justin Cutter, BA in Maharishi Vedic Science alumnus, travels the country spreading the word about the benefits of organic natural food from an 18-foot box truck with a fully functional greenhouse in the back. 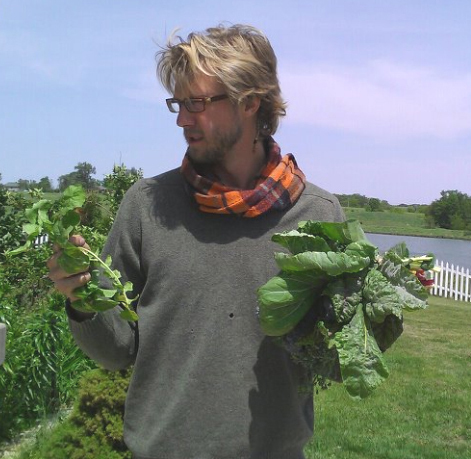 Learn more about his endeavor at the Compass Green Project website. 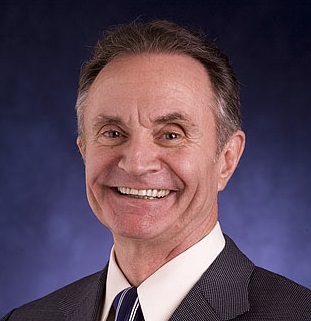 Jim Bagnola, a graduate of our MA in Maharishi Vedic Science, is a corporate educator, international speaker, and executive coach. 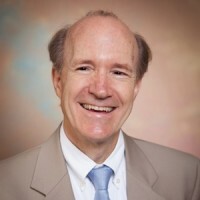 His book, Becoming a Professional Human Being: How to Enjoy Stress-Free Work and Personal Happiness Using the Mind/Body/Work Connection, was released in 2012 and has become a bestseller in Japan. Gabriel Akura, a graduate of our MA in Maharishi Vedic Science, has returned home to Kenya to help citizens of the tiny village of Rageng’ni as a sustainable agricultural entrepreneur and educator. Gabriel holds five university degrees, including a Doctor of Education degree from the University of Missouri. 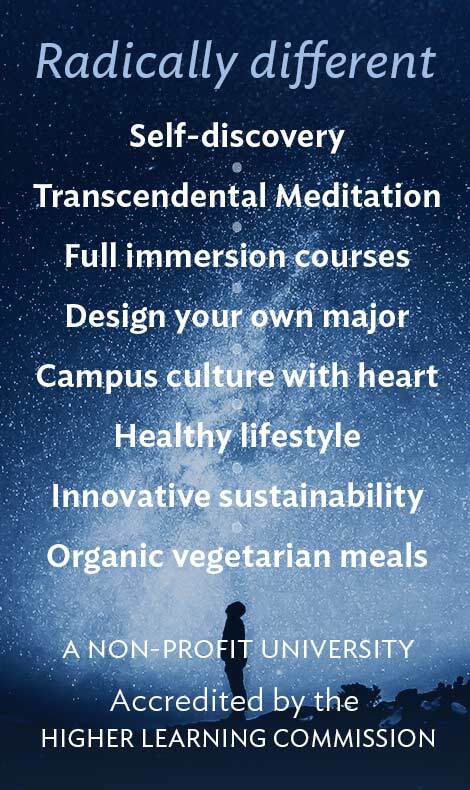 When you study Maharishi Vedic Science at the BA or MA level, you can choose to train as a teacher of the Transcendental Meditation technique and earn academic credit toward your degree. Career opportunities for teachers exist worldwide through The David Lynch Foundation, which has taught the TM technique to over 120,000 at-risk youth in the U.S. and around the world. 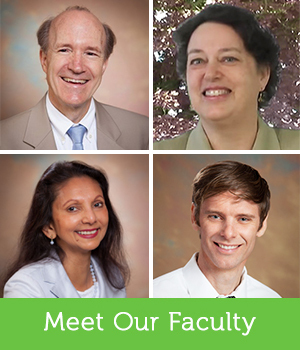 “I direct brain research in the Center for Brain, Consciousness and Cognition. In addition, I teach courses and tour in the U.S. and internationally, presenting on the brain and consciousness. “The courses you take in this department are designed to allow you to explore your inner dimension — to find out who you are and how you relate to the environment. Our emphasis is on self-knowledge, on the growth of higher states of consciousness.